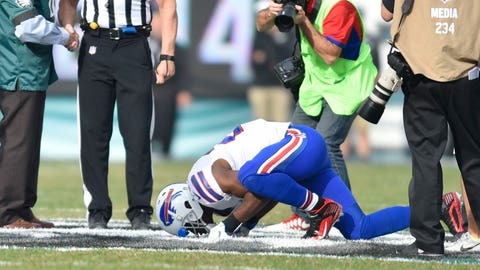 LeSean McCoy took time out to kiss the logo of his old team, the Philadelphia Eagles, when he went to midfield as the Bills' only captain. Last week, Buffalo Bills coach Rex Ryan laughed when he was asked whether running back LeSean McCoy would be a captain against his former team, the Philadelphia Eagles. Given his history of trolling the Bills’ opponents each week, it was obvious McCoy was going to go out for the coin toss. What wasn’t as obvious was that McCoy would be the only player to go out as a captain. Prior to Sunday’s kickoff, McCoy made his way out to midfield … alone. If there’s one head coach who would try something like this, it’s Ryan. He’s never shied from controversy or drama, especially this season — his first with the Bills. In every game, his captains have been players who once played for that week’s opponent. Sunday, however, Ryan took that to another level. McCoy and his former head coach, Chip Kelly, had an eventful week leading up to this game. Kelly reportedly tried to reach out to McCoy several times but was ignored. And even when McCoy did answer the phone, he hung up on Kelly. Still, McCoy did show respect for his old team, if not his old coach, when he kissed the Eagles logo when he went out for the coin toss.